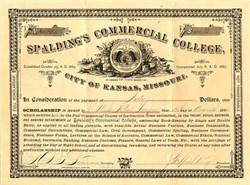 Two Beautiful certificates from the Spaldling's Commercial College issued in 1890 and 1891. 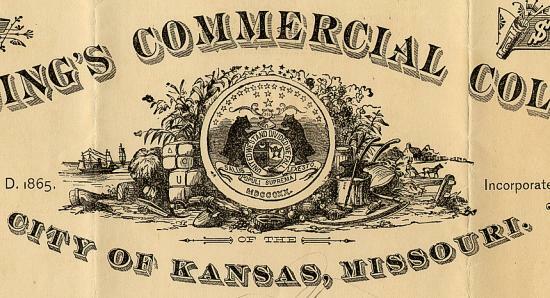 These historic documents were printed by Hudson-Kimberly Banknote Company and has an ornate border aroundthem. 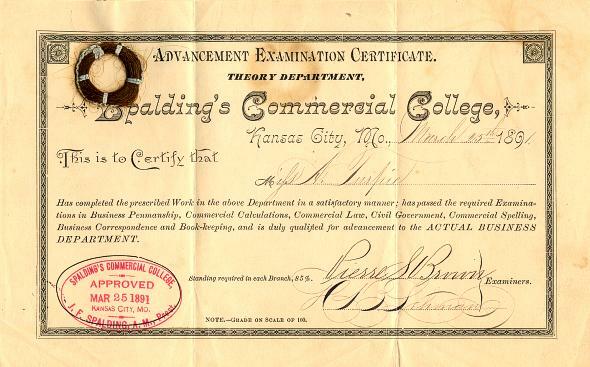 This item has the signatures of the Company's President, J. F. Spalding, and Examiners (on the second certificate) and is over 117 years old. TO THE READER: AT NO time in its long and eventful history of over a third of a century has this old and reliable College been so well equipped and prepared to give Young Men and Women that which they most need, namely, a Thorough and Practical Business Education. 2. Because its Courses of Study are eminently thorough, interesting and practical, and embrace all the latest and best improvements. 3. Because its Tuition, in all Departments, is as low as is consistent with the highest grade of scholarship. 4. Because its Rooms, in number, size, equipment, and convenience, are surpassed by none. 5. Because its facilities, through its Free Employment Bureau, for aiding its Graduates in securing good positions, are vastly superior to those of any similar College in the West, for the following reasons: (1) Because of its Established Reputation as a first-class Business Training School acquired by over thirty-four years of earnest, faithful, and successful work in teaching nearly eighteen thousand Students who have attended it; (2) Because nearly three thousand of its graduates and former students are now in business in Kansas City, alone, either for themselves or others, and naturally refer to us when they wish to employ Book-keepers, Stenographers, Telegraphers, Book Typewriter Operators, etc., or know of others who desire such assistance; (3) Because the Diploma and Graduate's Letter of Recommendation of this Institution have a recognized value among the best Business and Professional Men everywhere, wherever its long and successful career is known, and will therefore secure advantages to its Graduates not furnished by new or untried Schools of unknown merit and doubtful responsibility and continuance. You are cordially invited to visit the College, at any time, and personally investigate its unsurpassed advantages.